Have you ever walked in a restaurant and wished that you had never even opened the door? Had this experience while visiting my friend Autumn in Long Island this past weekend. We were trying to grab sandwiches on our way to the beach so we made a pitstop at a deli/bagel place. As we walked inside, I looked at the first meat case. It was completely empty. The second meat case contained shrink-wrapped paper towel rolls on display. There were also bottles of Tylenol for sale. A manager emerged from the backroom, and was enthusiastic enough. "What can I get for you?" he asked. But I didn't want anything particularly from this restaurant, as I value my life. I tried to communicate this with my eyes to my friends. It didn't work. We all stood there hemming and hawing for awhile, trying to leave without insulting the manager too much. An impossible task. After we escaped and regrouped on the sidewalk, my friend's husband said, "I can't believe we stayed there for that long. Obviously we weren't going to order anything." Meanwhile, all of us girls had been thinking, "Well, I don't want to eat here, but maybe one of my friends wants to eat here. I should consider her feelings." Too polite! 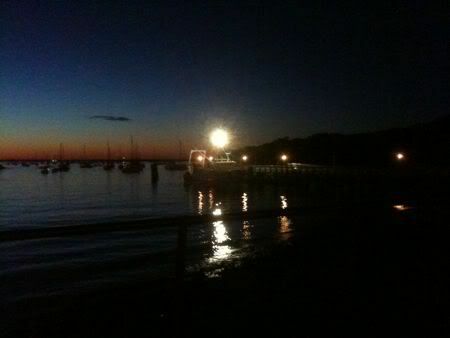 Just so you don't think my mini-vacation was all suspect delis, here's a picture of the water at Port Jefferson! 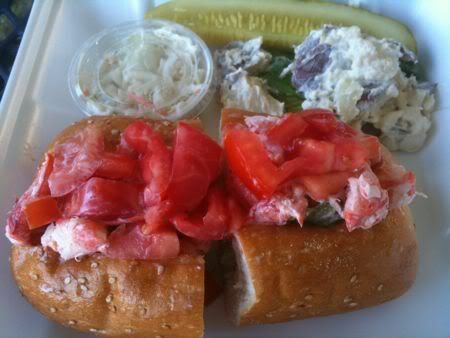 And another of the fine lobster roll I got at Braun Seafood - $2 more expensive than the Lobster Roll truck in D.C., but I didn't have to wait two hours for it. Posted in Travels and tagged with Long Island. September 3, 2010 by Adele Chapin.